Looks like I'll be the August 7th guest on The Advertising Show, sponsored by Ad Age. This is a fun, spunky, highly informative two hours of live radio, hosted by ad vets Ray Schilens and Brad Forsythe. Visit the web site. 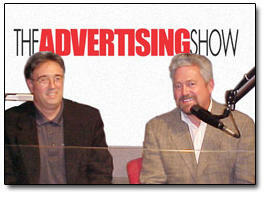 There are dozens of archived shows featuring impressive advertising, marketing, and media pros. However, I don't think they archive every show - so I'm going to have to do something between now and then to be important enough for archiving. Maybe if I rob a bank, assassinate someone, 'out' a CIA agent, or (this would be my best shot) break up a celebrity marriage, I'll be deemed worthy.